For about a week. And it might be a good thing because after the Uribana massacre and Raul Castro becoming a pro tempora leader of an allegedly democratic organization would have made me write very mean posts. But this week I am in a country where I can walk alone in the dark past 7PM and where grocery store shelves crumble under goodies. I might as well enjoy it, no? It looks like things are coming to a head for the regime. 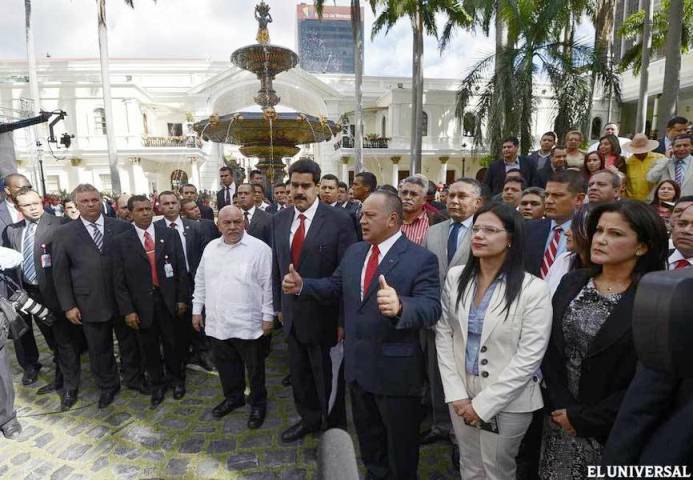 Alleged Vice-president Maduro traveled to the seat of the Venezuelan government in Havana for a day to collect a few signatures from Chavez, in red ink appropriately since they seem to be designed to face the economic troubles ahead. From what Maduro said on his return tonight we can only surmise that the situation is difficult, that the devaluation camp has won (exit Giordani?) and that Maduro is supposed to bring a conciliatory message to the private sector of Venezuela, barely a couple of days after he said that he would never talk to them. El error que cometió El Pais de España en publicar una foto de Hugo Chávez entubado que no era trae desafortunadas consecuencias. Todos tenemos el derecho de equivocarnos y le perdonaremos este desliz a El País, por lo menos nosotros los que no nos olvidamos de la trayectoria de un gran periódico que no se puede manchar con un solo desliz, por mas grande que sea ese desliz. Cuando uno publica centenares de trabajos a la semana es un milagro que haiga tan escasos errores. These days I really do not know what to think of Capriles. An example is him granting an interview to Panorama, the pro Chavez newspaper of Maracaibo, whose biased questions right there give you a cue. I suppose Capriles is right to speak to any media but he should measure the consequences as Panorama titled the interview, for all practical purposes, "no unity inside opposition". Local chavistas beamed, I am sure. At least this is what I suspect. Newspaper of reference, El Pais of Madrid, which is to Spanish what Le Monde is to French or the NYT to English has been scammed. Tweets today announced that they were going to publish a picture of sick Chavez (why? to begin with). That picture was of Chavez supposedly intubated. January 23, 23 de enero, is a symbolic date in Venezuelan history. It marks the end of our last to this one. It is of course fitting that a neo fascist movement as chavismo is tries in every possible way to first erase that celebration, and then co-opt it. Today the cooptation was under a rally march to support Chavez, assorted with quite a few undemocratic insults toward the opposition, which goes to tell that chavismo has no clue as to what 23 de enero means. Sin comentarios. Weil lo dice todo. P.S. : Sorry for not showing the image for a few hours. I was away of any computer. It is fixed now. I hope. Coming back? Not coming back? But this Saturday I got my chance. I went to the ATM for some cash and I saw a huge line to enter MAKRO. That store is a member's store, like Cotsco in the US if memory serves me well. In short, either you have a membership card or you ask for a day permit. The line was for the day permit requests. Although I needed nothing, as a member I went in to check out on all the fuss. It is nice to see that while at the OAS seat in Washington all but a couple of folks play dumb on Venezuela, a few blocks away at the Washington Post Jackson Diehl calls it as it is. Yes, I know, once again the Einstein theorem that man is the only animal stupid enough to repeat over a mistake will be proven with this memo. Or was that the thing about expecting different results with the same methods? I get confused when I get tired..... Still, allow me that note to the opposition leadership even if it does not read me. The little scene that happened yesterday at the OAS is turning out to be more interesting than what you may think. Note: if you are a fervent opposition leader stop reading now as you will probably do not like what comes next. Another day, another scandal. Or is it all planned provocation? Thus we are left with what is becoming an obvious question. Considering all the actions of the new regime today, from baseless accusations of food hoarding to rigging nomination decrees, what are the real intention of the regime? Is the regime seeking a confrontation to excuse some state of exception and avoid elections altogether Or at least jail leading opposition candidates? The situation is going to boil over real soon. Food shortages whether planned by the regime or a result of its incompetence are not only rising but as far as I can tell (and I am in the food business) the regime is not doing anything to remedy that except confiscating precarious inventory, exhausted in a few days and that of course no business will bother replenishing least the regime comes calling again to steal your stuff. 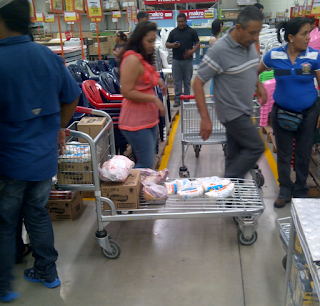 The 3% inflation of December coupled with food shortages and failure to offer dollars to allow business to remediate the situation with a chavista base crisped by the health of its not so living god and you have the basic ingredients to provoke something that you can blame on the opposition. As a specialist pointed out again today in Globovision, nearly half of the country has no access to independent source of information. The only news they have access to, if they have no internet or smart phone, is state media, pro Chavez or eunuchial printed paper. Manipulation is easy, and it can only be done by the regime. AGAIN: Globovision only reaches in open broadcast Valencia and Caracas and in many areas there is not a single radio station where you can get a view different from the one of the regime. This has gotta be the chavista prayer recently. Since January 5 we can say that the average constitutional violation has been one article a day.... I am not going today into the details because for one thing they may be bait for the opposition and tomorrow they may actually prove that Chavez signed something that Maduro was not allowed to do today but announced anyway (second part of this entry). but the strange thing is that I am starting to have that feeling that they want the chavista crowds to believe that they are indeed violating the constitution deliberately as a way to show strength. Woe is us! Again, Blogger's platform is acting up! It happened last year on October 7 and a lot of people could not access the blog. Now it is more wide spread since I cannot access several Blogger pages, including mine and Gustavo's. The problem has been going on and off since Friday which actually makes me suspicious... I can read your comments through the edit page that I can reach but I cannot reply to them. Please, let me know whether you can read the blog and from which country. This entry will be erased when things get back to normal. Just a little comment on Chavez: is he alive? I really do not follow much the gossip as to whether Chavez has a tube inside here or there. 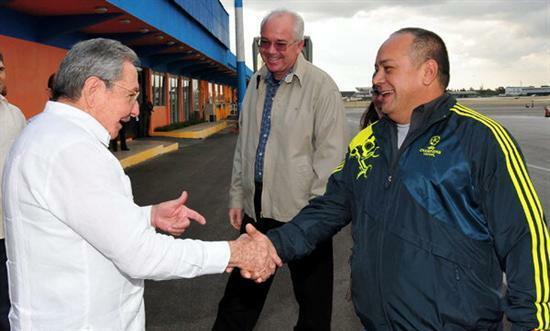 Nor do I agonize about the contradictory "communiques" of chavismo from ministers to Chavez's brother. No, no point wasting time when it is plain obvious the guy is really sick. That is enough for me. There has been now one month we have not heard anything direct from him. No photo. Not even a signature on a letter to announce his inability to show up on January 10. A letter, note, that anyone could have written and just presented him for his signature. Can anyone believe that a media crazed clown like Chavez would not even stamp a signature? This weekend, the more important figures of the Venezuelan state, the ones that have power, real power, were reporting to their colonial overlord, all together, in Havana. That the meeting took part, at least in part, at the airport so as to offer the excuse of "Look who just happens to walk by! Let's say hello!" does not diminish the crude reality that Venezuela is unbelievably a Cuban colony where the local appointees must go on occasion to report. And we should not be surprised. Today well known figures have contradicted the speech that Primero Justicia has advanced so far. Meanwhile AD and related parties keep rather silent. As it is usual in Venezuela all are sort of right and all are sort of wrong, hence the danger of a fatal split. Let's start with the clear driving theme here. If chavismo has perpetrated a constitutional coup this week is to find a "legal" way to keep Nicolas Maduro in charge so that when elections are called he will run as the incumbent, the one that spreads goodies to the voter. Chavez has bought 4 elections (2004, 2006, 2009 and 2012, 2 for one in 2012). Thus Maduro thinks he can buy his own election. But he needs time and power. Hence the coup which 1) sets him in place as the top dog until election day, or until Chavez comes back, whichever comes first and 2) gives him all the time he needs to get ready assuming Cuban medicine is miraculous enough to keep Chavez on life support whatever time it takes. Now, there are many flaws on this plan. 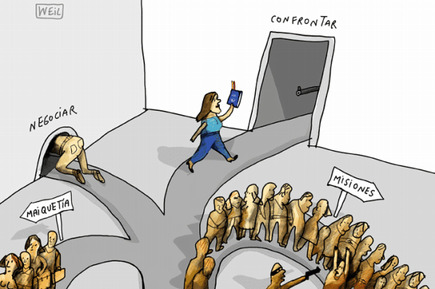 Has the Venezuelan opposition options? I am tempted to write the short answer: NO. But it is more complex than that and the historian in me knows that all such regimes eventually end, often with or shortly after their leaders. I do not want you to go to bed disheartened, so I am typing fast some positive thoughts I got while walking the dog. Well, it did not take long. Around 1 PM, the Venezuelan high court, TSJ, decided that it was OK for somebody that has not been elected, not even to a local council, to rule over Venezuela for as long as it takes. You can discuss at will the merits and demerits of that decision but the unavoidable fact is that Nicolas Maduro, AN APPOINTED OFFICIAL, will be for all practical purposes president of Venezuela for as long as he can get away with it. It could be short, a few weeks, until Chavez dies or comes back, or it can be long, as long as Chavez is plugged in to some device that keeps it alive even if brain dead. Even the high court of Venezuela had trouble putting its act together to violate the constitution: it left journalists waiting for 3 hours before finally TSJ head honcho Luisa Estela Morales Lamuño decided to tell the country that for all practical purposes Hugo Chavez was elected Hugo 1st, king of Venezuela, and that Maduro will rule until either Chavez decides to come back, or dies, or whatever it is that happens in monarchical succession. The TSJ ruling is simple: there is no absence of Chavez temporal or absolute. Chavez is out on a medical trip, he just has a job leave as any Venezuelan worker would, which will last as long as he needs it to last. As such the government he left in place continues as if nothing, the swearing in of Chavez is a mere formality, but necessary, and as such it can take place at anytime. There is no need to replace Chavez, he is president of Venezuela even if he is on life support. Heck! Brain dead for that matter as long as the Cuban artificial lung keeps pumping oxygen in his lungs. Is Hugo Chavez still alive? This is not an idle question. As just seen on TV Diosdado Cabello has announced that Chavez will not be here for his constitutional swearing in next Thursday 10. Diosdado officially announced that article 231 will be invoked and that the high court, TSJ, will swear in Chavez at his earliest convenience. Staring down into the abyss? OK, so vacation is nearly over and it is time to blog a little bit more consistently. Thus I thought you may appreciate a short guide to January 10, now that the media and web and blogs are overflowing with all sorts of things. Is there a coup d'etat? Technically not yet. True, the Chavez regime has made so many coups already that one would tend to think that the actual coup to ensure that Chavez rules after his demise has already been done. But it has not, yet (though a mini judicial coup has been done to silence the last remaining independent voice in the high court in prevision of this week). Whatever coup chavismo is planning to avoid the constitutional rule will be done from this typing until sometime on January 10 when supposedly Chavez should be sworn in. ¿Qué hacer con la última declaración de Marco Aurelio García? El tipo viajó a Cuba el 31 de diciembre. El 31 de diciembre, entiéndase bien. Allá se entrevistó con Nicolás Maduro, con Raúl Castro y con Fidel. Con un venezolano y dos cubanos. De estas reuniones se atreve a informar que en Venezuela existe una "cobertura constitucional" sobre de que no importa que tan rápido se recupere Chávez, tiene 180 días para juramentarse. Primero, ni Nicolás, ni Raúl, ni Fidel saben un carajo sobre lo que es una constitución. La que les pase en frente se la raspan. Aparentemente tampoco le importan constituciones al sinvergüenza de Marco Aurelio que lo único a que fue era asegurarse que Brasil cobre los reales que le debe Hugo. Para eso fue que lo mando Dilma Rousseff, porque si fuese para saber de los asuntos legales de Venezuela con la embajada de Brasil en Caracas bastaría. Digo yo. Segundo, como nación es humillante que nos enteremos de que el asesor ese haya ido a Cuba, y no pudo ni siquiera entrevistarse con Hugo. Lo dijo él en su conferencia de prensa. En otras palabras, por si acaso ustedes no entienden bien las implicaciones de esto, Marco Aurelio fue a hablar con los dueños de Venezuela, el poder colonial, los hermanos Castro. Con respecto a Venezuela Raúl y Fidel están empezando a parecerse mas y mas a Leopoldo el rey belga con el Congo…..
Tercero, para rematar, comparen con lo que paso en Paraguay y Honduras. Aquí lo único que cuenta, el único parámetro es lo que le interesa a Brasil cuando hay problema alguno en Latinoamérica. La democracia y la ley son opciones a aplicar según convenga al imperio brasileño que parece estar más establecido y arrogante de lo que uno creía. ¿Entonces Dilma? ¿Eso es lo que hay? ¿Ordem e Merda? En portugués, si no me creen. The theater of the absurd keeps rolling in Caracas. Today, in a normal country where the elected president is more dead than alive the powers in place would have started preparing for a transition, consulted around, etc.. Here in Venezuela the opposition is accused of all evils, is told that never shall chavismo speak to them, while we are told the constitutional provisions are optional, mere formalities. OK, so I will be on the road tomorrow and I will not be able to follow what will happen in the all important installation of the National Assembly. Thus I figure out I should write my best possible educated guest before I take off. As expected, I was so taken by other matters that I have not read a paper or watched a news cast since last Friday.... I am sorry I could not post my best wishes to readers of this blog and talk some about what to look for next year.